Back in March 2016, we talked about the ISO standard for QFD that a group of international experts have been working on for several years. Hiroe Tsubaki (Chair); Glenn Mazur (Convenor); Georg Herzwurm; Kim Stansfield; Dennis Frankos; Biljana Visnjicki; Chad Johnson; Carey Hepler; Noriharu Kaneko; Masayoshi Koike; Marius Cronje; Avinash Dharmadhikar; as well as members of the Japanese Standards Association, QFD Institut-Deutschland, American Society for Quality ISO Technical Advisory Group TAG 69, and QFD Institute. This standard is intended to guide both novice and veteran product and process developers who use QFD, including practitioners of Six Sigma, Lean Six Sigma, and Design for Six Sigma. The standard provides detailed examples and guidance to promote compliance with multiple QFD approaches to the skills needed to achieve 21st century innovation, competitiveness, and quality. 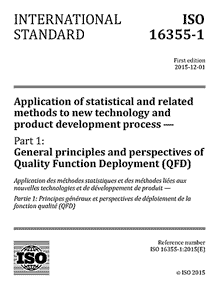 One of the important decisions the ISO working group made early on was to make this standard in descriptive rather than prescriptive, so as to expose practitioners to the full depth and breadth of the QFD concepts and methodology, and not limit to one particular model. Highlighted in particular are Akao's Comprehensive QFD, modern Blitz QFD®, and the German QFD models. References to the 4-Phase and GOAL/QPC Matrix of Matrices are also included to guide those using these classical models. Both modern and classical models are included because we are living in a world of rapid changes in technology, business models, globalization and anti-globalization, environment, lifestyle, information, etc. It is hard to develop future products when you are bound by old methods and mindsets. For example, a wall-sized House of Quality that worked well forty years ago may no longer effective for today's agile and IT-oriented businesses. Therefore, it is important to recognize that any approach to new product development must continue to transform over time for a business to survive and sustain success. It was our intent to make the new standard stand the test of time in this regard, and open the eyes of QFD practitioners to multiple broad possibilities and options from which they can find a feasible best path for their unique situation, rather than mandating them into a narrow alley, such as only a House of Quality. Following this same train of thought, we have included case studies with the tables and charts from their original sources without forcing them into a uniform format. This way, you can see that real QFD never looks the same or uses the same tool, that best implementations are always tailored, and that companies use various QFD tools to address their unique situations. Another important point of this standard is that it provides QFD tools for business goal alignment and business redesign by using related methods such as Hoshin Kanri, for example. The standard shows the QFD approach to new product development from a business standpoint, not just the traditional engineering and specification-based viewpoint. For successful compliance with this new standard and effective QFD new product development, we recommend the QFD Green Belt® and QFD Black Belt® courses. You will get the first-hand guidance from the convenor of the standard, as well as templates for the tools discussed in the standard. The 2-day International Symposium is complimentary to Boise course attendees. Begin your journey to compliance with ISO 16355 now. For questions about training and/or implementing good QFD for your project, please contact us.